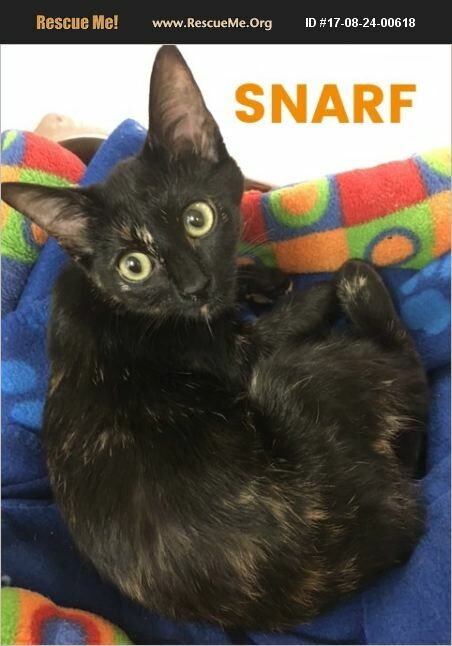 Snarf (about 3 1/2 months old as of 12/16) is a female dark tortoiseshell short-haired kitten. Snarf was found with her mom and siblings living under a carport in Waukegan. The kittens were a little on the older side and very wild like their mama, and poor little Snarf took the longest to come around to loving people so she is the only 'ThunderCat' kitten left up for adoption from her litter. She still startles easily and doesn't appreciate being chased around by the bulldog or preschooler in her foster home, but she does love to play with people now and she usually starts purring as soon as you pick her up. A good fit for homes with other cats, very calm dogs, and older kids.